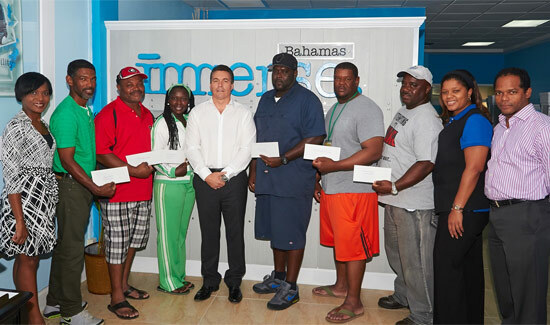 Freeport, Grand Bahama: Local Investor Peter Hunt of BahamaLand Investments made a financial contribution to the combined Grand Bahama Carnival Company on Thursday October 2nd for the development of prototype costumes for the highly anticipated Bahamas Junkanoo Carnival set for May 7-9, 2015. Grand Bahama Island will also play a major role in Bahamas Junkanoo Carnival with major events on the road to Carnival, as well as its very own weekend of activities slated for April 17-19, 2015. With the belief that the rich Bahamian culture should always be center stage and on display for visitors to the island to experience, Hunt explained that after being asked, he was delighted to come forward to assist the Junkanoo Groups in getting ready to be a part of Bahamas Junkanoo Carnival. Grand Bahama, he believes, should be afforded every opportunity to share the culture of The Bahamas with the world. Peter Hunt, a UK property investor, is currently awaiting Government’s approval for the purchase of the Port Lucaya Marketplace. He is also interested in further investments on Grand Bahama Island. The Grand Bahama Cultural Carnival Company presently consists of members from various local Junkanoo groups. The establishment of the company will also prove beneficial to local seamstresses, make-up artists, designers, artisans, straw vendors, musicians, and food vendors, and is expected to be a major boost to the Grand Bahama community. Peter Hunt’s donation is the first injection of funding and sets the wheels in motion for the start of production, sale and distribution of Carnival costumes made by the Grand Bahama Cultural Carnival Company. The company’s theme is “The Grand Life” and the costumes will depict images exclusive to the beauty, jewels and history of Grand Bahama Island.